​In this article, we short-list the top bed rails that are currently on the market. Our aim is to provide you with the essential information needed to decide which is the the best bed rail for your needs. Bed rails offer support and assistance during sleeping at home, in hospitals, and in the elderly and recovery care homes. They are also referred to as side rails, half or safety rails, bed handles or assist bars among other terms. There is only a small tweak in design between hospital and home bed rails. However, it is important to ensure that you buy a home bed rail to ease the process of installation. Care should be taken when using a bed rail as fixing them wrongly can cause injuries to the user as reported by FDA. Though rare, there are people who roll out of bed while they sleep; for this a long bed rail to cover a large part of their bed comes handy. There are practically thousands of bed rails in the market today, each promising to offer the best protection against falls at night. Among them, you need to discern the best bed rail, one that offers you great performance without breaking your bank; a task that can be challenging. We got you covered though, read through to learn more. Why Should You Invest in a Bed Rail? This is another bed rail created for the home bed style. It is designed to assist you to get on or out of bed with ease as well as to protect you from rolling out of bed. This rail is popularized for its ability to adjust lengthwise after you have installed it in bed; there are not many rails that have this functionality. When not in use, the rail can fold down giving you unrestricted access to your bed. 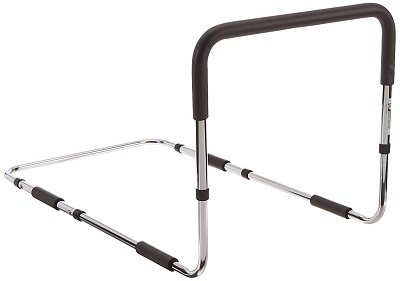 This bed rail is for you if you lose balance, lack mobility or you roll out of bed at night. With its organizer pouch, the rail keeps you remote. After installation, you can adjust the bed rail from 26 inches, to 34 inches, or up to 42 inches based on what function you need to put the bed to. You can place this rail on either side of your bed. 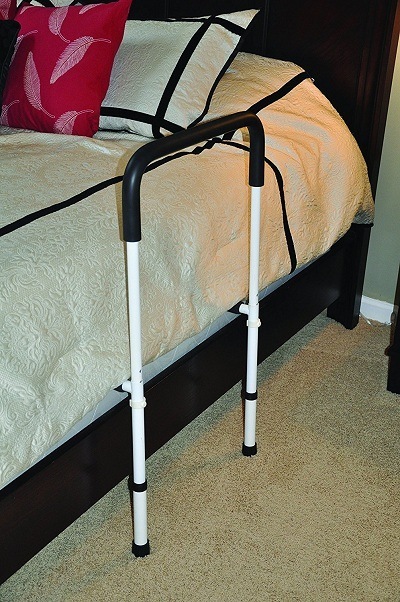 Assembling this bed rail is easy as it fits perfectly on a home bed, a hospital bed or any adjustable bed. Better yet, it comes with a safety strap for stability and an assembly video to ease the process of installation. The rail can support up to 300 pounds. 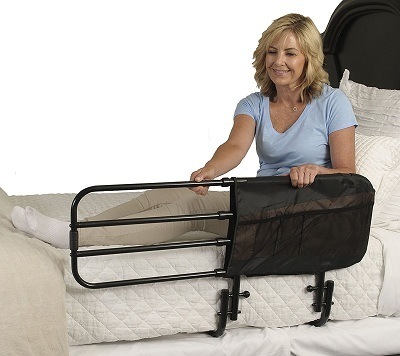 The Stander EZ Adjust and Pivoting Adult Bed Rail has received lots of praises on Amazon.com with most reviewers mentioning its ergonomic design that makes it easy to install and fold down. It also has a great price and has the ability to support heavy individuals. However, one disadvantage that stands out in the reviews is its dull color that looks more of an industrial than a home rail. True to its name, this bed rail from Drive Medical assists you to climb up and down your bed with ease. It is designed for a home-style bed and easily slips beneath the mattress and attaches to either side of your bed. It fits perfectly thanks to the "no-slip foam" feature fitted on the base bar; this feature ensures that the rail holds its position the entire night. Not only can you easily attach the handle, but you can also easily remove it. The Drive Medical Bed Assist Handle is offered with an all-steel construction with chrome plating making it strong, sturdy and easy to clean. When you buy the package, three pieces will be delivered. These pieces can be easily joined with no tools to form the bed rail. Again, you can dismantle the rail flat for easy storage. 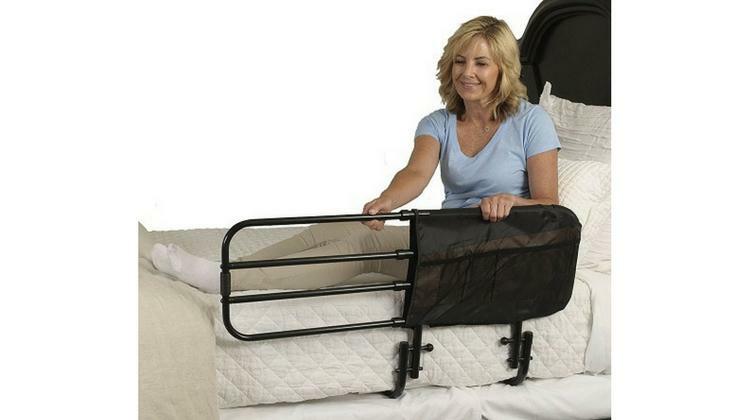 When set up, the rail can support up to 250 pounds; this makes it an adult bed rail. To keep you at ease, the manufacturer offers a lifetime warranty. The height of this rail can be adjusted from a minimum of 13.5 inches to a maximum of 16.5 inches. The rail measures 19.75(W) x 13.5(H) x 32.75(D) inches. 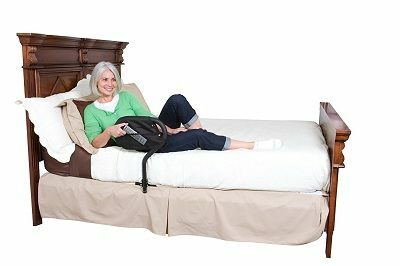 It is designed for adults, especially the elderly who needs assistance getting in or out of bed. This bed has a great rating with most reviewers on Amazon.com citing its great performance, awesome fit, sturdiness, and great fit. However, most reviewers complain of the rail's unfitness for low beds. You can only use this rail as a hand rail to assist you out of bed. However, it has been designed to offer great performance on that front. First off, it features a steel construction with a cushion grip handle, which ensures that the steel cane is always warm to touch and non-slip. Installing this hand assist is easy, as you only need to slip it under your mattress and attach it between your mattress and box spring. 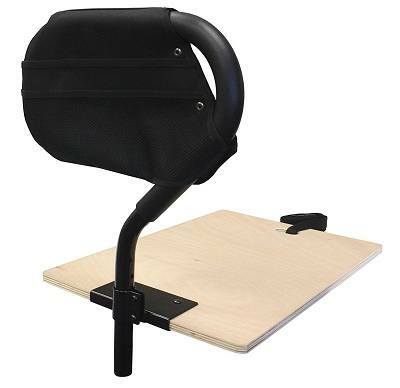 It fits perfectly on home beds, hospital beds, and adjustable beds. Depending on your height, you can adjust this rail from a minimum of 19 inches to a maximum of 22 inches. It goes well with all types of mattresses including thick pillow top mattresses. Each package comes with a 4-pocket organizer, which makes it easy for you to access items that need to be close to the bed. This feature is especially important for the elderly and the sick who need to take medicine often. The rail supports up to 300 pounds when installed. Though this is suitable as a handrail, its length can be adjusted from 16 to 21 inches. When not in use, this bed rail folds down. Storage is also easy as you can swiftly fold the rail. With a lifetime warranty, a user is assured of a quality build; the heavy duty steel with powder-coat finish ensures durability. 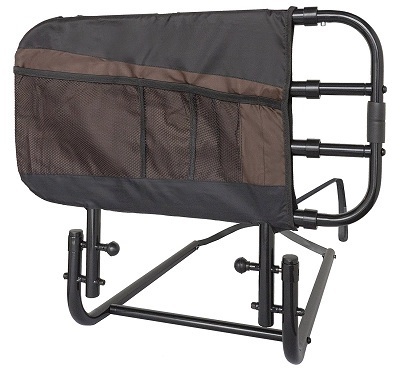 On Amazon.com, this product has been able to garner lots of reviews with most reviewers saying the product delivers as a bed assist hand rail. Other reviews cite the rail's durability and ease of installation. However, a few design flaws have been highlighted in the reviews notably the screw holes, which do not fall in line, and the organizer, which can be injurious. Designed to prevent falls by enabling users to get in or out of bed with ease, the Endurance Hand Bed Rail comes with an ergonomic build to ease installation and enhance the process of dismantling. It fits beneath the mattress where it can be secured with a strap to the box spring. The rail extends three inches into the mattress to ensure that you easily secure it. Even better, it comes with non-slip sleeves for a more secure fitting. It is designed to fit on home beds, hospital beds, and adjustable beds. You can adjust the height of the rail from a minimum of 17 to a maximum of 21 inches. Plus, it features a 20-inch wide non-slip ergonomic handle. You can break this rail down and pack it in your bag when traveling; you will only need a large suitcase. It holds up to 300 pounds. For durability, the rail is made of chrome plated heavy duty steel; this is not only durable but also easy to use. The pouch is an additional purchase not included with the bed rail; you can use this pouch to place items that you may need to use at night. At 6.5 pounds, this product is light enough to fit on your bed. The majority of reviews on Amazon.com for this product are positive. Most reviewers are impressed with the performance, the price, the simple but sturdy build and the ease of assembly of this rail. However, there are a couple of negative reviews with most complaining that the height adjusting buttons do not last long. The bed rail reviews above show you some of the best rails in the market. However, you may not know why you need a bed rail in the first place. The main benefit you get when you buy a bed rail is safety and convenience. First off, it allows you to climb up or down the bed with ease and safely. This is especially important if you suffer from a mobility problem or your legs are refusing to carry your body weight for whatever reason. Most of the rails are designed with an adjustable height, making them ideal for people of all heights. For this, the rails are great for the ones recovering from sickness, and the handicapped. Sometimes it happens that you roll out of bed; this is mostly common for the elderly. Whether it is part of a dream or you just toss in bed the normal way and find yourself on the floor, you need a bed rail to protect yourself from the injuries that may result from this. With a bed rail, you are likely to have a good night’s sleep knowing you are protected from night falls. The process of getting in or out of bed will be a little less challenging as well. The best bed rail is the one that meets your needs and offers you a long period of service. Ergo, you need to consider what your needs are when shopping for a bed rail. Safety: how much support do you need and how stable/sturdy is the rail? Weight load: can the rail hold your weight? We love the Stander EZ Adjust and Pivoting Adult Bed Rail thanks to its versatility, ease of assembly, price, high weight load, non-slip grip and its sturdy build. 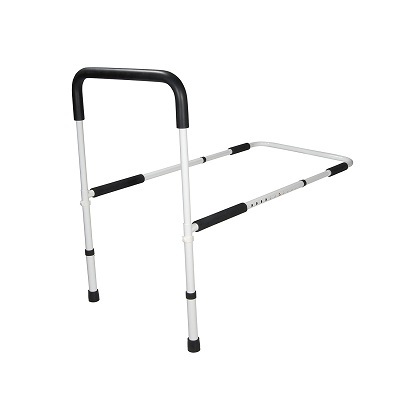 The rail can be used to assist the elderly get on and out of bed as well as restrict you in bed at night. With its pocket covers, this rail offers great performance for all. You will find it easy to assemble and it is foldable for storage and packaging when traveling. Make a comparison to get the right bed rail for you but above all, remember that your needs will determine what is right for you.